Pike Place Market is way more than a farmers market, offering a real variety of fun things to do. The Market sprawls across several city blocks packed with a broad cross-section of urban life. A large chunk of Pike Place Market is officially designated as a National Historic District. It operates all year round and includes well-established businesses as well as stalls and crafts booths that change vendors on a daily basis. Pike Place Market is a colorful and exciting place to hang out and explore. There is much more there than you could possibly see and do in a single visit. Each time of day and season of the year brings new experiences. Yet there are certain things that are a part of every visit to Seattle's Pike Place Market, fun things to do and see that keep visitors and natives coming back time and time again. Here are the top 10 activities and attractions that are always part of a Pike Place Market experience. Many of them are free! No matter where you're from or what your background, there's something beautiful and satisfying about the sight of abundant fresh foodstuffs. Baskets spilling over with fresh berries. Ice bins filled with salmon, crab, and shrimp. Tables stacked high with plump tomatoes and blushing peaches. Strings of bright chili peppers. You'll see plenty of that at Pike Place Market, particularly in the Main Arcade and the Corner Market and Sanitary Market buildings. Fresh food, food products, and dining options at Pike Place Market come from the Northwest and around the world. Food producers, particularly those along the Main Arcade, offer sample tastes of local cheeses, preserves, candies, and more. Fresh nectarines or cherries can be so enticing you'll buy and eat them right there. Throughout Seattle's Market area you'll find food counters serving cuisine from Russia, Greece, Italy, Vietnam and more, as well as bakeries and delis. Your sit-down eating options range from casual counter service to fine dining. 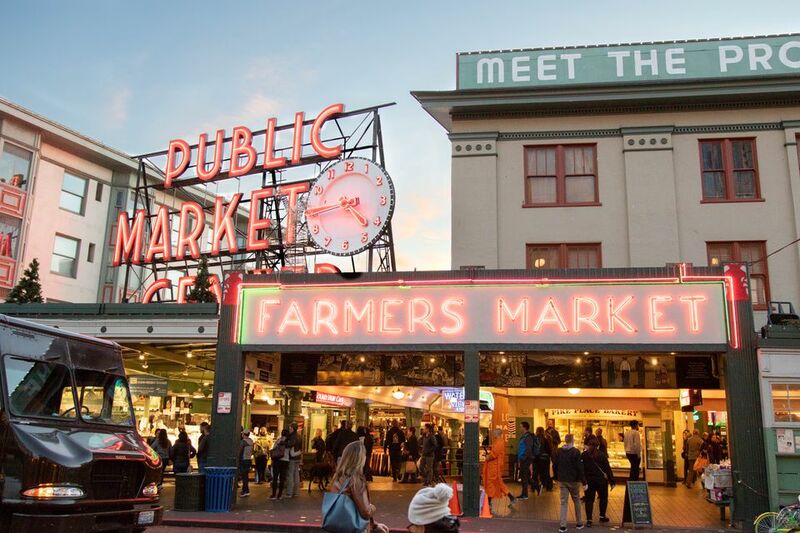 Good food is definitely among the top things to do at Pike Place Market. As you stroll Pike Place Market's Main Arcade you'll see long stretches of gorgeous flower bouquets. Most are locally grown, brought fresh to the Market each day in colorful masses carried in five-gallon buckets. The abundance and variety of flowers lead to beautiful scenes and are a favorite photo opportunity. You can pick up a beautiful mix, wrapped in paper, for as little as five dollars. Clustered at the north end of the Main Arcade you'll find the Market's day stalls, rented out to craftspeople on a daily basis. The rule here is that all the vendor's offerings must be handmade. You'll find handcrafted goods of all kinds, from fine woodwork and musical instruments to colorful jewelry and art prints. Soap and lotions, pet toys, leather goods, and pottery are among the other handcrafted items typically found at Pike Place Market. The large bronze piggy bank located under the big "Public Market Center" sign and clock is known as Rachel, named after the real pig that served as the model. Rachel has become the Seattle Market's mascot. Coins and bills placed in Rachel's slot fund the Market Foundation. Taking a photograph with the big bronze pig is among the most popular things to do for first-time visitors. Not only does Rachel make a great spot for a photo, with the colorful Pike Place Fish Market in the background, but she's a convenient landmark to meet up with friends. The shops and businesses facing Pike Place, which include the first floor of the Main Arcade, the Corner Market, and the Sanitary Market buildings, are in the heart of the Pike Place Market district and are part of most visits. But there's a lot more to see and do at Seattle's public market. There are many shops and service providers located "Down Under", the floors below the Main Arcade. ​Post Alley, home to many great restaurants and specialty shops, cuts through the neighborhood. Take the time to explore and you'll be delighted by new discoveries. Whether you're looking for the conventional T-shirt, a tasty treat, or something truly unique, you'll find that Pike Place Market stalls and shops are packed with Seattle souvenirs of all kinds. Smoked salmon, Market Spice Tea, or a jar of cherry preserves make a thoughtful thank-you gift for the neighbor watering your lawn while you're away. Matted photos, Northwest Coast art or a watercolor of the Seattle Market are all wonderful mementos of your own Seattle adventure. Whatever you have in mind, you'll find it at Seattle's Pike Place Market. What's a busker? A busker is a street performer. You'll find buskers of many talents throughout the market. These street performers are permitted and regulated by the Pike Place Market Preservation and Development Authority. Acts range from guitar soloists to entire bands. There are pianists, fiddlers, magic shows, and jugglers. Many have been entertaining Pike Place Market visitors for years. Buskers play for tips, so be sure to show your appreciation. Actually, unless you're really unfortunate where you stand, you aren't at risk of being hit by a flying fish. Full-sized fish--usually salmon--do fly through the air at Pike Place Fish, accompanied by the fishmongers yelling out the order. Pike Place Market visitors love to gather and watch, and rightfully so. It's very entertaining, and the fishmongers obviously enjoy their jobs.